Frequently imitated and widely influential, Howard Phillips Lovecraft reinvented the horror genre in the twentieth century, discarding ghosts and witches and envisioning instead mankind as a tiny outpost of dwindling sanity in a chaotic and malevolent universe. Lovecraft’s preeminent interpreter S.T. Joshi presents a selection of the master’s fiction, from the early tales of nightmares and madness such as “The Outsider” and “Rats in the Walls,” through the grotesquely comic “Herbert West—Reanimator” and “The Hound,” to the overpowering cosmic terror of “The Shadow Over Innsmouth” and “The Call of Cthulhu.” This definitive edition reveals the development of Lovecraft’s mesmerizing narrative style and establishes him as a canonical—and visionary—American writer. 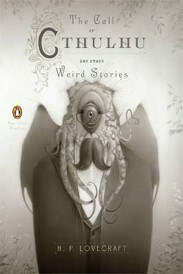 The Call of Cthulhu and Other Weird Stories. By H.P. Lovecraft, Edited with an Introduction and Notes by S.T. Joshi. New York, NY: Penguin USA; 2011; ISBN 978-0-14-310648-7; Paperback. This book may be purchased in paperback from Amazon.com or Barnes & Noble or directly from the publisher, Penguin USA.